We Did It! – Thanks to everyone who helped make this game a reality! After an alleged attack by the Chepakwik Indians, the people of Bronco County are on the brink of war. Only a farm boy who knows the truth can stop it. Together with his three friends – a gunslinging desperado, an Indian princess, and a calamity jane – he must expose a conspiracy by bringing to justice the six outlaws of the notorious Saints-Little gang. Their journey will take them through cowtowns, Indian villages, ranches, gold mines, prisons, and into the very heart and soul of the American Wild West. But on their epic adventure to right the wrongs of the past, will they see justice done or discover an even darker secret lying in wait behind the scenes? 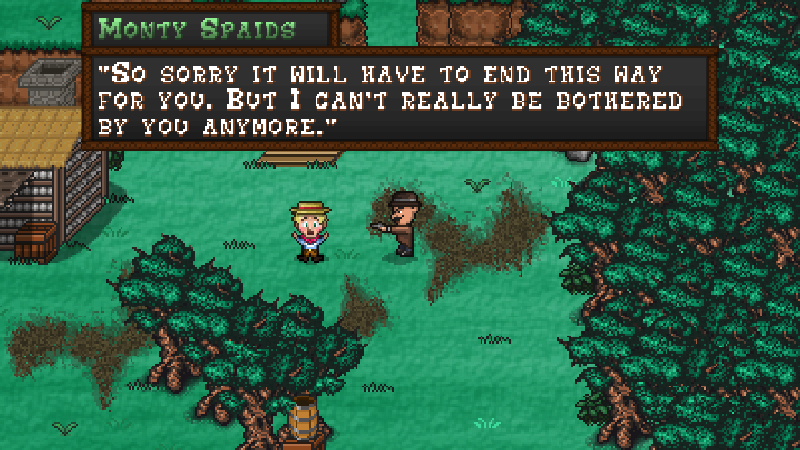 So, Just What is Boot Hill Heroes? Take one part Final Fantasy, one part Earthbound, add a dash of Chrono Trigger – then dip the whole thing in spicy Wild West sauce! 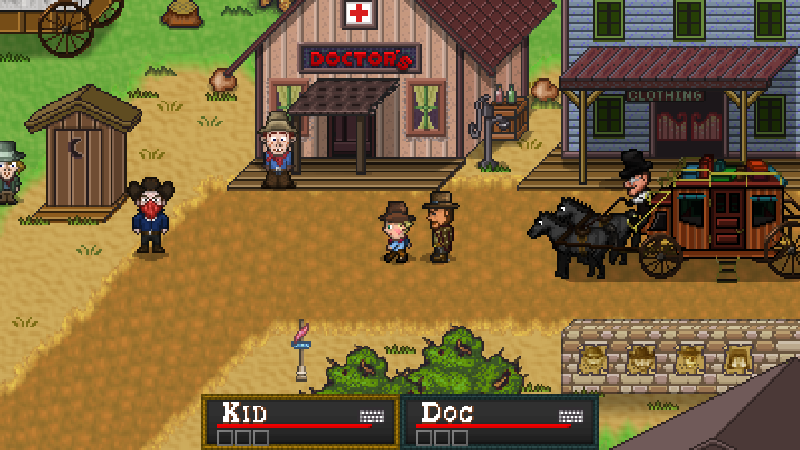 Boot Hill Heroes is a true retro RPG set in the American Wild West. You’ll find all the trappings of a spaghetti western – gunslingers, saloons, Indians, ranches, spittoons, Mexican standoffs, heroism, villainy, and everything in between. Boot Hill Heroes has adventure, drama, and a fair helping of humor. 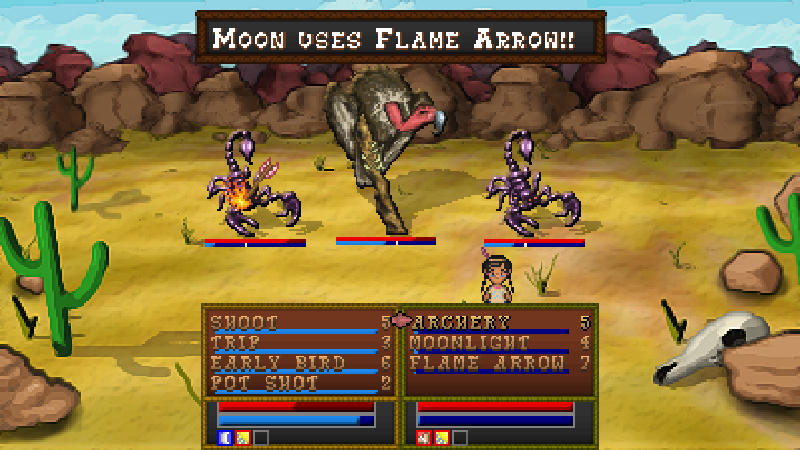 It’s just like the classic RPGs you remember from yesteryear but with an inventive new spin! Say what? A Four-Player coop turn-based RPG? That sounds like crazy talk. Not really. The game has four characters, so we thought – Why not make it four players? Up to four players can drop-in or out at any time. We’ve even designed a menu system that allows all four players to simultaneously manage their characters’ equipment and abilities. Check out the video for more info on this. I hope this will come to either PS3 or Steam at some point! (’cause I sold my 360) I’d love to play it. Every game developer wants to get on Steam so we promise to ask Valve once the game is finished! (drool) WOW….just one thing though, I think making an Ipad version would be ideal but I’ll still buy this definitely, can’t wait for the release. Good job guys! As a fellow XNA/C# developer trying to break into the indie game scene you guys are a huge inspiration! It doesn’t hurt that my favorite game of all time is Earthbound either. You can expect my patronage and constant stalk(age) of your project! Keep up the awesome work! Awesome! Great to meet another XNA developer. Since we have similar taste in games, can’t wait to see what you come up with! 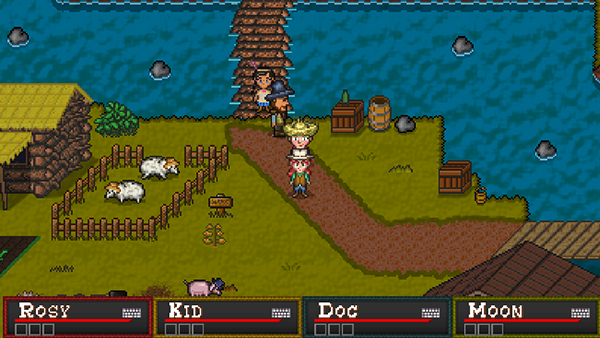 Oh My God, Spaghetti Western + SNES Style RPG? Is this my dream come true? I’ve NEVER wanted so much to colaborate with a project. Hey thanks for your support Sir Laguna! Thanks! So many people have requested a mac or iOS version that we’re considering making it a stretch goal. I saw your trailer on Screwattack and am quite interested in your game. I am a musician and do midi compositions, would be willing to work for just a project credit (i.e. you wouldn’t have to pay me). Just send me an email if you want me to send you some samples of my already existing compositions. Hey thanks for your interest. While we appreciate the offer to compose for just credit, we insist on paying a composer. Feel free to send any samples to dave [at] experimentalgamer [dot] com, although we won’t seriously be looking for a composer until June depending on how the kickstarter goes. Yeah!!! you made it!!! Kickstarter goal meet! this game looks super ballin’, man! keep up the good work! LOVE the Earthbound look! Saw your game on starmen.net. Pitched in 50 bucks. Good luck! hey i really want this game where do i get it? No nailed down day, but some info regarding that coming soon. Looking forward to having a go at this. Keep up the good work, guys! This is awesome! How close are we to a release date? Fantastic. I literally cannot wait for it. Thank you! You guys had a fantastic showing at Pax last weekend. It played great, looked great, and was a ton of fun. There were a ton of neat little details (the branches hanging over the train tracks was a nice touch) that made this game stand out. Looking forward to playing the full version! I like the premise an awful lot, but I can’t help but notice that some of the sprites look like they were ripped straight from Earthbound itself. I’m almost kind of worried that someone might take legal action. I’m honestly not someone who would know whether or not that’s a real concern, but even still. I would like to play it when it comes out, though. It’s been awhile since a game like this has come along. Thanks for your interest. To address you concern: I’m no lawyer, but I don’t think making a new game with similar art direction to an older game is grounds for legal action (I think ‘ripped straight from’ is a bit of an overstatement). Definitely picking this up close to release date. Question, though. Does it allow for online multiplayer? I’d love to play this with my best bro over the internet. It won’t have online multiplayer at initial release. But we’re going to make an effort to add it down the road. Looks great! Really want to play it. Also, should it be considered a crime this isn’t coming to the e-shop? I played this game at c2e2 I was the guy in all blue who beat the boss with you good sir. This was an excellent game I hope to see it released one day! Awesome! Glad to hear you enjoyed it! Nothing concrete to update with. Hopefully we’ll finish as soon as possible. The game looks very cool, I will pre-order soon. Do you have a new estimated release date? It’s coming soon. We’re testing the game now. Sorry for the delays. I cannot wait to dive into this puppy! It’s been a month since the last person asked, so is the testing almost done? The first round of testing is finished. Now we have to go back and make some improvements before the second round. I just had to say you guys are awesome for doing this! Earthbound is one of my favorite games of all time and I really love how you flipped that art style. You have some really interesting ideas, can’t wait to play this! Congrats! Loved watching the vid and seeing what you did with the active multiplayer while walking around. Looks like the new art style added more black in the outlines, if I’m correct? I had to sit and stare at it a bit before making up my mind, but I think I’m liking the bolder appearance. Glad I backed this long ago. Can’t wait to play! Hey David. Yes, there’s some black outlines around the sprites to separate them from the backgrounds. The environments use more textures now. The sprites have more detail. The enemies have a kind of embossed look to them look more like cut outs. The battle backgrounds have a oil paint style. And the brightness has been turned down while the contrast has been cranked way up. That about covers it! I’ll be purchasing day one. Loved the Mother series, I know it’s a way down the line and you still have to complete this game but I hope more 4 player co op rpgs are on the way from you guys in the future, I love playing deep rpgs with friends and the drop in drop out co op system and item browsing you can do while your main member walks the world map is great for not interfering with game play every time someone wants to heal up or change equipment, you’d think stuff like this would have been implemented in the genre a long time ago as it’s common sense but you guys figured it out, congrats. Been following the game since your kickstarter, look awesome im planning to play the game with my friend in coop mode. Talked with you guys before pax on twitch couple months ago and you said back then you were planning on releasing the pax demo to the public. Im wondering if its still the case? We need more news! how far are you guys in development? (I saw the credits screenshot on your twitter couple weeks ago) Day one purchase, cant wait to play 😀 Keep up the great work! Hey Mike. I can safely say we’re wrapping things up on Part 1 of the game. Porting to the Vita slowed me down for the last two months but that’s finally almost finished. I completely forgot about the suggestion to make the demo available. It’s a good idea because it gives people a chance to see what the multiplayer is like. I know I need to get a Greenlight page up but I just haven’t gotten around to it yet. Thanks for keeping up with the game. Just a quick Merry Christmas to you guys! keep up the great work and take some time to enjoy the holidays! Just experienced game breaking bug at beginning of game on Vita. Killed all the varmints in the barn, went back inside house, mom was there but I accidentally went to hallway. Now mom is missing and I’m stuck in a loop where I can kill the king varmint over and over again but never leave the farm I find mom to turn in quest. This one is entirely my fault and should have been found before release. It’s a mistake in the way plot events are handled. If you already saved your game, there’s no way to fix it. You’ll have to start over. I’ll make sure it’s fixed in the third patch. Again, very sorry about this one especially since the reason for it is entirely my fault and could have and should have been prevented. If you do not wish to start over, you could wait until a patch is out, but it will be some time because I will have to wait until the next review cycle. Have run into a game breaking bug on the Playstation Vita. While on the second map of the whispering woods, I saved the game down by the old man by the lake. When I reloaded the game it returns to the screen with the old man by the lake, but my characters Kid and Doc can not be seen or moved. I can open inventory and can even hear them mount their horses when I press the triangle button, but there are no viewablle or moveable characters. There doesn’t seem to be a way to go back to a previous save, so now I’m faced with starting the entire game over. Let me try to wrap my head around what could have possibly caused that and I’ll see if there is a way to fix it without you starting over. Yes, this is another mistake on my part. Your location data saves incorrectly. I can fix it with a patch, but I already have an update in queue and it will take some time before the store will put another update up after that. I’m very sorry about this. These things happen. It’s an otherwise great game. It’s outstanding that it has a developer that willing and rapidly takes ownership of these early issues. I look forward to future updates. Thanks again for quickly addressing this and taking the extra step to privately email me for alternative options towards resolution. Keep up the great work! Green is the on setting. 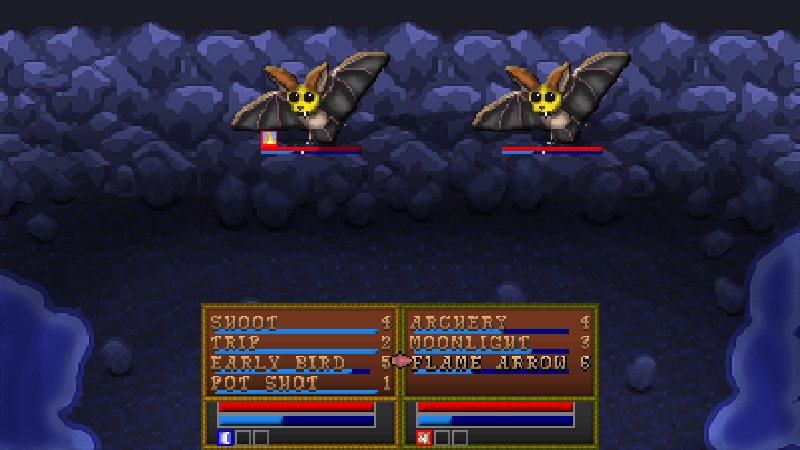 Turning the Battle Hints on will display a description of every Vantage an enemy uses during battle. This will turn itself back off at the end of a battle. Someone had it on all game and didn’t realize that’s what it did and was really annoyed by all the messages during battle. Awesome! Thanks for the reply! So hey, I just got to Swellsville, and there’s this dude in an Indian headdress off named E. Picurus. When I talked to him, all he said was “EPicurus.SwellsvilleTown2A.1 not found.” So it seems like his dialogue’s bugged… Sorry if you’re already aware of this. I’ll be on the lookout for more strangeness; where can I send them? I wasn’t aware of that, thanks for bringing it to my attention. I’ll look into that one. Sorry about the break in immersion! Looks like the entire group of NPCs, standing around the campfire has dialogue that cannot be found. Yeah, I see the problem now and how a recent change caused it. At least it’s not game breaking, but the PSM will need a another update now. I’ll need to fix it and have the humble store upload a new build. Then I’ll send it out to you. Hey i’m encountering a game breaking bug for the vita version of the game. After the first cut scene where the father has the shoot off and there’s the epilogue where it says “10 years later”, the game starts loading the next part the game but it crashes and kicks me out. No problem man. Thanks for the heads up 🙂 I also went to the linked page and read a comment of someone with the same problem and he also has a 64gb memory card. Maybe that could be the problem? Also my vita is a 3g/wifi model so that crosses out the wifi only model being the problem from that comment. I purchased the PC version, and I really want to play but I can’t seem to sync it up to my controller. Is there a FAQ or instruction guide somewhere that I’m missing? I see the Keyboard by the name in options screen, but no way to change it to anything else? What kind of controller are you using? I’m afraid only Microsoft controllers only work at this time. Just a random PC controller. Is there anyway to reconfigure the keyboard then? There is not. But you’re not the first person to request this feature so it’s on the list of things I’m considering implementing. Feel free to email me your thoughts on that. Also, if you have a PS3 controller there is third party software available that will make your PC think it’s an Xbox controller. Hi there. Any window release for the Second Part? The characters Lv./itens will get transfered for it? I don’t want to promise anything I can’t deliver. But it looks like Part 2 will be out within the year. And hopefully your data will transfer to the next game on most platforms. Any updates on when Part 2 will be released? Loving this game so much! Too soon to predict a release date. But it won’t be nearly as long as the wait for Part 1. Hey there, I’m Exotix! 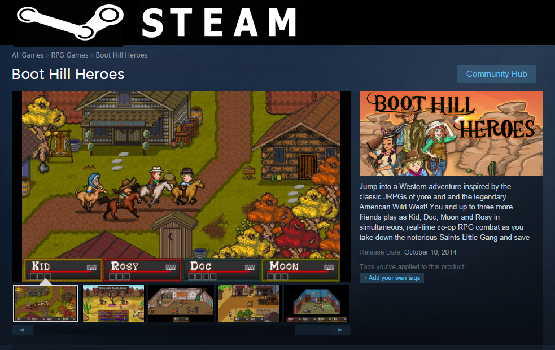 I review and stream videogames on Hitbox and would be very interested in covering your upcoming game, Boot Hill Heroes! I ask that you please provide me with a review copy of your game or add me to a list of potential participants so I may showcase your game on my streams. find out if it’s for them. I have been streaming and Youtube for over two years now, and I have professional equipment to showcase your game the way it deserves. Please email me and we’ll figure it out. Hello My Name Is Bobby. I Want To Review The Steam Edition But I Dont Really Have Any Spending Money At This Moment. If You Were To Give Me A Review Copy I Would Do A Review For it On Steam Its Self. Let Me Know If This Is Something That We Can Do Thanks. so i am asking for a review copy. the game looks fun as hell. Email me and we’ll figure it out. The Steam version coming out tomorrow is only going to available for PC, not Mac? Extremely disappointing, I’ve been waiting too long for this game. I’m not sure I even care anymore. Some Mac users can run Windows applications like this one. I’m not sure how, but I’ve seen it done. Maybe that would make a good blog post. There’s a program called Wine that can run some Windows programs on Mac OS and Unix/ Linux platforms. See WineHQ.org It’s basically a Windows emulator. Never used it myself as I’m a Windows user, but it’s worth a shot. I get through the intro until it says “three years later…” then it crashes. I got past that once and after I went into the hall from the bedroom I went to the door in the far south after getting the flint and it crashed again. I reinstalled and tried it like 8 times. What do I do? Email me the details please! have you thought of making a “making of”? As a fellow developer I’d love to know which kind of tools you used for the game, and how they work! I just discovered this game today, so forgive me for being out of the loop with this question, but are both episodes released at this point, or is part 2 still pending? i have purchased this game on ps vita months and months ago and have never been able to get passed the intro. it crashes right after the last sentence of the intro. i get a System.OutOfMemoryException: Out of memory at (wrapper managed-to-native) and so forth… i need help as i would love to play the game but dont want to have to purchase it again on another platform. any help would be appreciated. Thanks. Hey Zack, I will send you an email about the issue. How do I beat Fool’s Feast? That desert is rough. If you’re party is too wounded to fight enemies, then just avoid them for now (the Bramblers are slightly darker than ordinary plants). If you walk around long enough you should fine a parrot. Follow that bird. Thanks…How do I escape from battles? I need to run from the lions with Rosy. I can’t find a manual and I skipped the tutorial. On the keyboard, hold down the space bar (unless you edited the keyboard controls). With a controller, hold down the trigger buttons. You can see all controls from the pause menu. The space bar control is not in the edit controls menu. I see what you mean. It only says “Switch Key” and Space. Dave, I work for the Indianapolis Community News paper. copies.I could not make out the apartment number and I put 4. Please let me know the correct address or at least apartment number. Thanks! I think we’ll get the rest of the episodes on 360 before the XBLIG market closes. I’m trying to figure something out, and I was hoping you could help me. What’s the difference between the PS Mobile (RIP, but which I own) and 360 versions of the game? Does the latter include all three episodes versus the former’s one? Thanks! There isn’t any difference, except that the PSM version was not able to support local co-op. None of the versions of the game have all three episodes since they haven’t been made yet. They are all the first episode. The second episode will have a different title. Hi there, I was hoping to find out if/when episode 2 might be on its way! I played this game on a whim after having it in my steam library for a while and absolutely LOVED it! It’s a fantastic game with glorious music, fantastic characters, a great RPG system, and a gripping story. and I’m practically salivating to find out what happens next! Any news to look forward to on that front? Thanks for the kind words Jacob. Part 2 or Episode 2 is finishing up. It’s in a state where I am playtesting it for bugs and difficulty, but it will still be a while and I have no firm release date I want to commit to just yet. Keep in touch and you’ll start to hear a lot more about it soon!